Odour Contol in Stables and equine transport ..FREE 1Kg of Stablesorb has been added at no extra charge...... ....We have now increased the 4 Kg drum to 5 Kg Drum and Kept the price the same........That works out at �3.60 a Kilo. 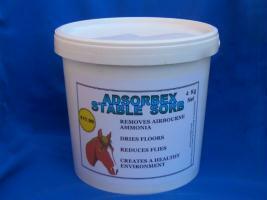 Now you can keep your stables virtually ammonia free using StableSorb(Dust Free) Granules. Horses can be described as lungs on legs, anything that affects the lungs will affect the legs. Ammonia created from the urine coming into contact with the bacteria in horse dung has been shown to interfere with the lungs. On hot days this can build up to near dangerous levels as well as attract flies. Up to now chemicals or Lime have been used to help control the ammonia, lime can burn and the chemicals can cause irritation. Removes impregated smells and reduces ammonia to a much safer level in stables and horse transport. Pour fine granules into small heaps on a clean stable floor and evenly distribute over the floor surface using a broom.